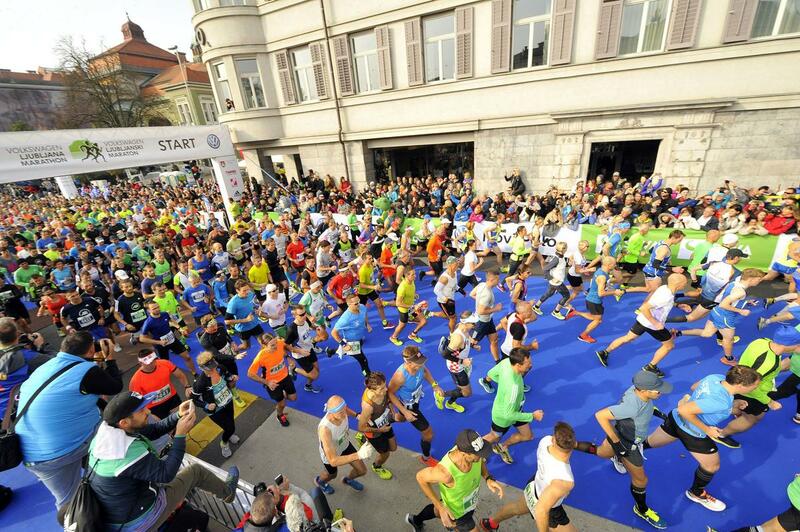 Sisay Lemma of Ethiopia and Kenyan Visiline Jepkesho shattered the race records at the 23rd Volkswagen Ljubljana Marathon, an IAAF Silver Label road race, on Sunday (28). Breaking from the pace setters in the 13th kilometre, Lemma forged on alone en route to a 2:04:58 run, smashing the 2:08:18 race record set by Ethiopian Limenih Getachew in 2015. Jepkesho didn't make her move until the 39th kilometre, breaking from compatriot Selly Chepyego to win convincingly in 2:22:58, clipping nearly two-and-a-half minutes from the 2:25:24 women's record set by Caroline Kilel in 2009. With heavy rain falling in the opening stages, the men's race started on a 2:07 pace but already at the five-kilometre point, reached in 15:06, Lemma appeared impatient. The rains had largely subsided by the 10th kilometre (30:07), with Lemma deciding to make his break from the 15-man lead group less than three kilometres later. Upping the tempo dramatically, he blazed through 14:35, 14:32 and 14:31 five-kilometre splits to reach 25 kilometres in 1:13:45, nearly a minute and a half clear of his closest pursuer, Ayele Abshero. Five kilometres later he extended his lead to nearly two-and-a-half minutes and by 40 kilometres was ahead by more than three. The 27-year-old's winning time was the second fastest performance of his career, behind the 2:04:08 lifetime best he ran in Dubai in January where he finished fifth. Gebretsadik Adhana of Ethiopia was a distant second in 2:08:36 with Hiskel Tewelde of Eritrea rounding out the podium in 2:08:49. Further back, Abshero was fourth in 2:09:12. The women's race was much closer, with six women – accompanied by a pair of male pacesetters – still in contention through the half: Jepkesho, Chepyego, defending champion Shuko Wote and her Ethiopian compatriots Sutume Kedebe and Dibaba Kuma, and Sharon Cherop of Kenya. Cherop and Wote were the first to fall back, followed by Kebede and Kuma, leaving just the two Kenyans to battle on after 35 kilometres. That score was settled by the 40th kilometre when Jepkesho had only the final pacesetter for company on the course's final lift near the Slovenian capital's central Prešeren Square. Her winning time was the third fastest of her career, trailing her 2:21:37 and 2:22:40 runs in Paris and Istanbul last year. Chepyego hung on for second, clocking 2:23:15 to knock more than three minutes from her previous best. Kuma, making her marathon debut, was third in 2:23:34. Cherop, the veteran of the field, was fourth in 2:25:02.